Right Folks. 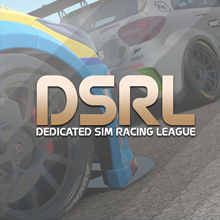 Signup thread for DSRL RC season 2 is here. Full details coming post haste so this here will be edited. Furiously unprofessional but time is against us. The Second championship starts next Monday, July 3rd, and consists of 6 rounds over 6 weeks. Each round will be open for 7 days. Each round involves running all 4 long stages of each country, with a win it or bin it power stage at the end. An extra point can be won on each power stage by simply being the fastest, but will it be worth it? Only you can decide. 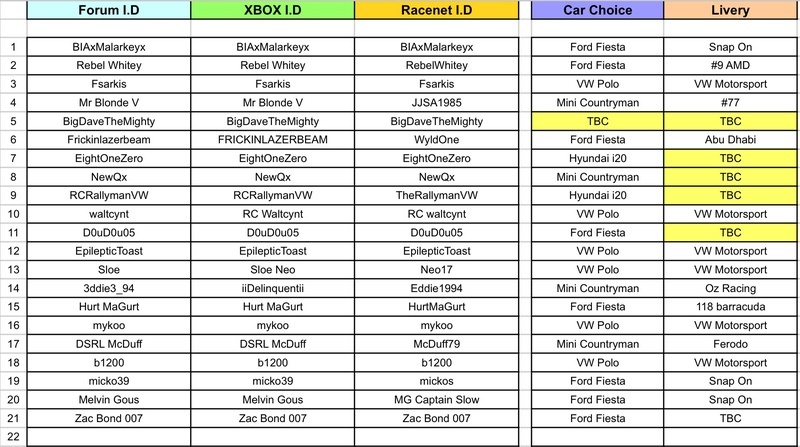 This is a driver only event, there will be no teams, and in the interests of going like the proverbial clappers Drivers are asked to find a seat in a 2010 spec car. PLEASE take a screen shot of your Event finish times. Racenet is currently suffering from a few unwanted gremlins and, as its about to become the washed up older sister I cant guarantee they will be corrected. 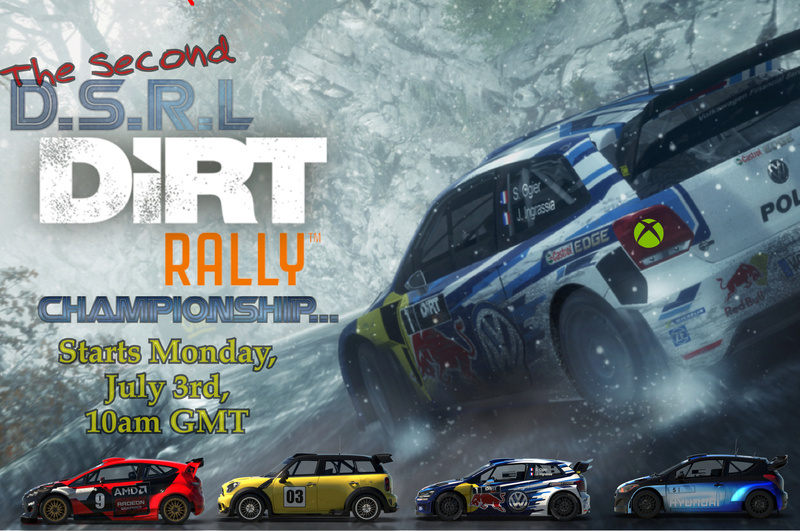 You are encouraged to post your Final time screenshot in The DSRL Xbox club activity feed, along with a brief description of your Rally! To be eligible for the power stage point you must A: Take a screenshot of your Power Stage Time and B: Upload it to the DSRL xbox club with the title (country) POWER STAGE TIME! *There will be an extra 60 minute window added to each 7 day rally for result overview and final standings confirmation, during this time no new finishing leaderboard times will be accepted into the results as they must all be submitted during the 1 week time-frame permitted before the added 60 minute window. *As there is no way of the league hosts directly controlling settings such as assists, views, HUD etc. these will be down to player personal preference. *We expect sign ups to participate in all scheduled rallies as they are each going to be live for a whole week. If you know you are going to miss a scheduled event we would ask that you message a DSRL admin/organizer and let them know beforehand. Once The Championship starts you cannot change your car choice. Should you decide you absolutely have to you may continue in the series under Rally 2 rules. eg, you will be credited for position but will score no points! See, now why can't everyone be that efficient!!! P.S. I'm SO happy we are doing another championship on DR! Nah you two aren't allowed.... youre too fast! Isnt your Racenet name JJSA1985? And isnt your racenet name Benjamin 0912?